The harsh reality or too much too soon? Interesting conversation in our car on the way to school today. Every school day we go the same route, passing many of the same faces every day. There is one gentleman who we always take note of. The sad state of affairs is that he must live on the street as he is usually asleep on his motorbike with a rickety old cyclo storing all of his belongings. 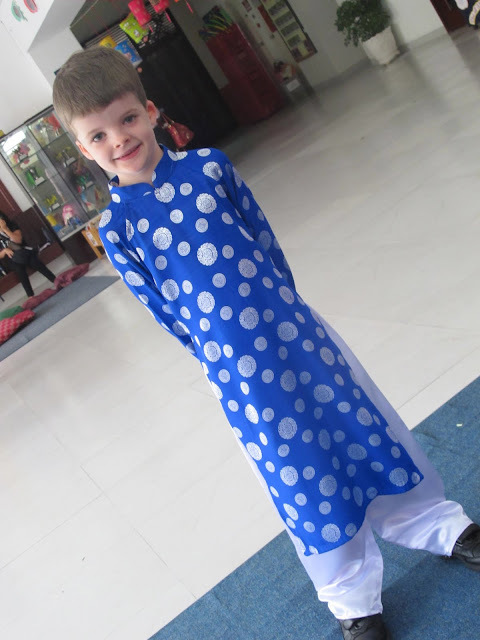 I try not to dodge around and sugar coat the questions that the kids invariably ask about him. Telling them more or less the harsh realities so they can see how lucky they are and start to think about ways they can help people less fortunate than themselves. Mr Hai must certainly listen to these conversations and I have no idea of his opinions on the matter....until this morning. Mr Hai, where has the man gone? Not a hint of humour or emotion. My jaw just dropped and I had to ask him again what he had just said. He confirmed his opinion in the matter that they guy had probably died. I protested that perhaps this harsh reality was a bit much for a 4 and a 6 year old to take in at 7.30 on a Thursday morning. He shook his head and said "They need to know that they are lucky to go to school and they need to listen and learn. If they don't listen they won't learn. If they don't learn they won't get a job and they will have no money for food and they will die." Well this kind of left me speechless. I mean how can you argue with that. It is moments like that one where the cultural gap between our two countries has never been wider. Who is right and who is wrong? Is ANYONE right or wrong? I certainly don't hide the harsh realities of life here from the kids. It is impossible to as it is out there for us all to see each and every day. In fact, in my opinion, when some of the awful things you see here stop concerning or affecting you then it is time to go. I do however think that that little bit of information might be a bit much for my two. They did not seem to react at all so maybe it was just a bit much for me. Perhaps a part of me just does not want to delve any further into the stories of some of the people we see. If I delve they become all too real. And my heart breaks. Not quite sure who learnt a lesson this morning. I do know that each morning I will be scanning the footpath in the hope that Mr Hai was wrong. I fear however, he may be right...about a lot of things. ....is sometimes not that hard at all! 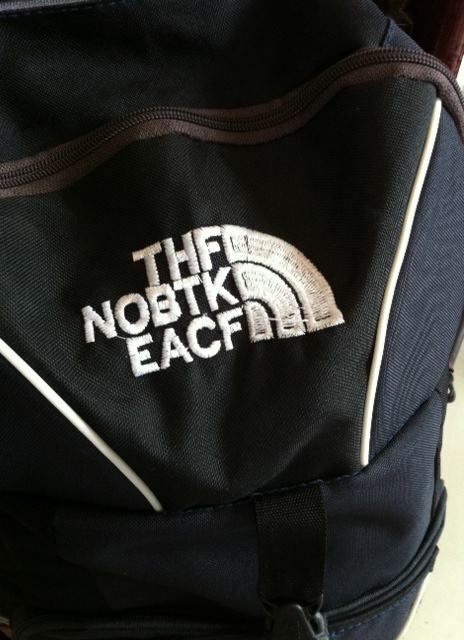 The North Face or Off Your Face? Photo courtesy of Peter Stuckings. When nothing really is something. I have spent the last 2 days in bed. Sounds nice yes? Well, yes and no. As per my previous post I have been hit for six by a virus. Not one to do things by halves, I feel like I have been hit by a truck. 2 days of bed rest is just what the Doctor ordered. Or should I say that is just what the Doctor should have ordered, along, with some antibiotics, instead of 2 blood tests, a chest x-ray and an ECG but lets not bring up that old chestnut. So I have spent Monday and today convalescing at home. It is actually harder than you think. Do you know how much I want to get up and clean out the messy top drawer or put all of the DVD's that the kids have left out back into their covers? A lot! Why is it so hard to do nothing? Why is it so hard to lie down without the "I should be doing this" conversation going through my head? Because I can't lie there and do nothing I pondered this thought. It gave me something to do that wasn't nothing. I have come up with this. Do you remember the feeling you get when you are on holidays? I don't mean the laying by the pool kind of holiday, I mean the "Oh my God, this place is amazing, there is so much to see and do" kind of holiday. I have come to the conclusion that my brain still thinks that I am on that kind of holiday. If I have a spare half an hour between work and picking up the kids I feel compelled to go and explore something. I feel I must go to a market, or visit a new area, or try that new dish I have heard about. What ever happened to the girl who if she had a couple of spare hours in Australia would flick on Oprah, flop on the couch and eat a Magnum? I have realised I can't really remember a time since I have been here that I have done NOTHING! Mind numbingly, boring, coma inducing NOTHING! Sure I have sat in front of the TV with Nick in the evening but even that is not nothing, it is spending time with my husband. When is the last time I had an hour during the day where I put on a movie just for me? Sometimes my somethings are truly wonderful, like having a massage or getting a manicure, but technically it is still doing something. I have to interact, nod, move, pay, arrive, leave. Oh I hear some of you saying, you poor thing. Well, thats fine because I do understand how lucky I am and I do appreciate it. All I am saying, more to myself than anyone else, is that I need to slow it down a little. I need to not feel guilty to finish work, come home and sit on the couch. I need to not say to myself "well, you have an hour, why don't you go for a run?" I fear it will not be easy because I really quite like being busy and exploring and adventuring, however, I think my body has just decided to give me a big wake up call. I need to take a breath and understand that this is life, not a holiday where I have to squeeze the juice out of every waking second. Now if you will excuse me I shall return to my bed to continue my convalescence and leave the top "man drawer" to its own devices. I'm having a nap. I never get sick. Well, hardly ever. Usually when I do it is something magnificently strange and I go down like Lyndsay Lohan in heels with a belly full of vodka. You may recall my last demise was chicken pox a few months back. At least one of the kids always has the sniffles or a cough. But not me. I take my vitamins every day like a good girl and am usually as fit as a mallee bull. So this week I knew something was up when I was just so tired. Cutting a long story short a sore throat arrived Thursday and as hard as my body tried to fight it off, it lost, and by Saturday morning it had travelled to my chest and voila....nasty chest infection. Me- I have a chest infection. She proceeds to take my blood pressure and temp and I wait for the Doctor. Doctor- So, you have chest pains? Me- no I have a chest infection. Dr- how bad are the pains? Me - I do not have chest pains, I have a sore chest because I have a chest infection. Dr- we need to do an ECG. 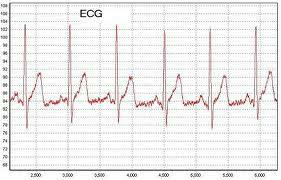 Me- we do not need to do an ECG. I am not having a heart attack. I have a chest infection. Dr- do you have numbness down you left side? I may be sick as a dog but I can see where he is going with this. I point blank refuse to have a ECG so we move on. Dani 1 Doc 0. Dr- do you have a fever? Dr- do you have a runny nose, cough, swollen glands? Dr- because you have no cough or runny nose we think you have Dengue Fever. We must do a blood test to confirm. Me- I do not have Dengue, I have a chest infection. Dr- we must do a test. So off we go for a blood test. Dani 1 Doc 1. Dr- we think you might have pneumonia. Me- no, I don't have pneumonia. I have a chest infection.Dr- we must do an X-ray. They call in the x ray dude who has probably been out drinking beer hoi, as you do on a Saturday night. 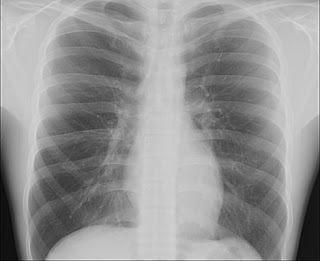 Chest x ray is taken. After a wait the results come back....you guessed it....negative. Dr- we think you may have glandular fever. Me- I do not have glandular fever. I have a chest infection. Dr- we need to do some more blood tests. Dr- I think maybe it is reflux. Ok..... That's it. Enough already. I have endured 2 pregnancies. I know what reflux is AND I DON'T HAVE IT. He can clearly see my exasperation and is probably nervous about the slighty mad twitch in my left eye. He tells me it is a 3 hour wait to get some more conclusive results from the blood test but I have had enough. I ask for the damn antibiotics that were all I came for in the first place and wait for it..... HE SAYS NO! Says it will destroy the good bacteria and sends me away with a throat gargle. (Do not even go there.... I dont have a f^* ing sore throat). Says he will call me later with Mono test results. So, I'm not even too sure what the final score is myself. What I do know is I left with a few puncture wounds, a nice picture of my insides for the kids to take to show and tell, some medicine for an ilness i do not have, a much skinnier wallet and no antibiotics. I would like to end in a bright note though. This all took place on a Saturday night and all up took just over an hour. I would hate to imagine what the process would have been in Australia. Not to mention the cost. Their thoroughness has had very positive ramifications with a few friends where things have been picked up that would otherwise be missed. It really does not surprise me however, that with any medicine your heart desires available over the counter here, that self diagnosis and self medicating is the norm. Footnote: he sent me an email this morning stating that the Mono test came back negative. I have no idea what this means or subsequently what I have. You don't suppose it's a chest infection do you? Get home and collapse - check! Seriously though, although busy there are a lot of things that I don't have to do which makes me wonder how all the mums I know in Aus do it. I tips me lid to you all. Now....off to deal with the homework! On our recent trip to Bangkok we visited some floating markets about 1.5hrs out of the city. 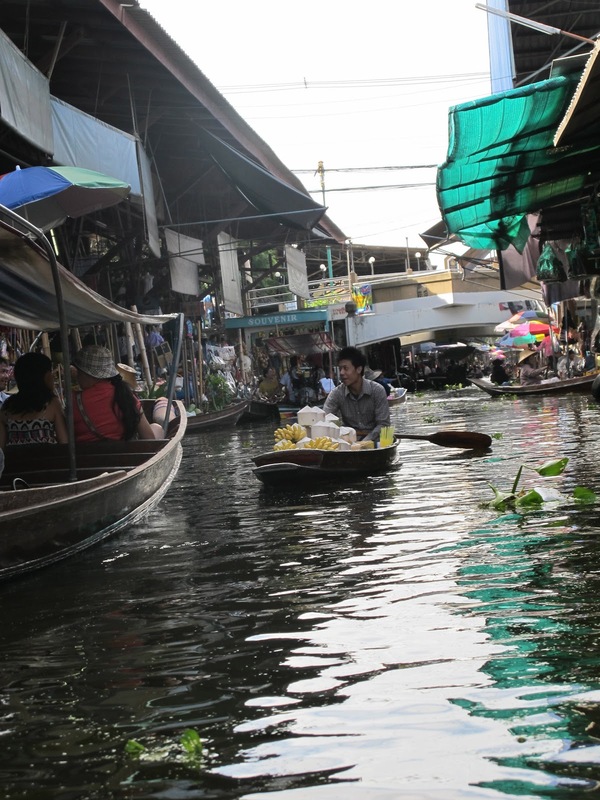 In 1967, The Damnoen Saduak Floating Market was first introduced to the world as a tourist attraction. It is a fun place for tourists to see the old style and traditional way of selling and buying fruits, vegetables, etc., from small boats. Every morning, hundreds of boats crowd the market area. Most of them are paddled by women with picturesque straw hats. You can find everything from vegetables and fruits to freshly-cooked noodle and souvenirs. Day in and day out from about 8 a.m. to about 11 a.m. the Floating Market is routinely crowded with hundreds of vendors and purchasers floating in their small rowing boats selling and buying or exchanging their goods. From this lady we bought beautiful chopped mango and bananas for a snack to keep us going. It's crazy busy. You really need to keep your fingers inside the boat or you will loose them! I particularly like the little floating kitchens. Wonderful aromas wafting by to match the stunning colours. Traditional hats worn by the vendors. The boat drivers are amazing to watch. Very skilful. Quiddy is not a big boat fan. He was very reluctant at first but with some delicate parenting (fine Christopher, you can stay here in the car and we will see you later) he now says that this was one of the highlights of our trip. As for this one, she sat up the front and just waved at everyone like the Queen. Nick re charging with an iced coffee. Check out the donk on this baby! We loved it! Did not buy much as it is very touristy and expensive but the experience was great. 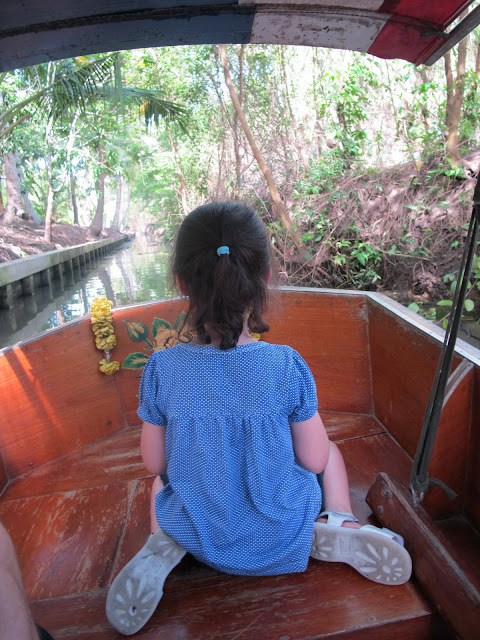 The kids especially like when out boat driver let it rip and we FLEW through the canals amid squeals of delight. Will try and convert one of the movie files and post so you can see it all happening. Not sure the still photos do it justice. A lovely way to spend the morning. Têt-Trung-Thu - The Moon Festival. Today in Vietnam it's all about the moon! How cool to have a festival dedicated to the moon I say! In Vietnam, Têt-Trung-Thu (tet-troong-thoo) or the Mid-Autumn Festival is one of the most popular family holidays. It is held on the 15th day of the 8th lunar month, during which, the moon appears larger than at any time of the year. The moon represents fullness and prosperity of life. 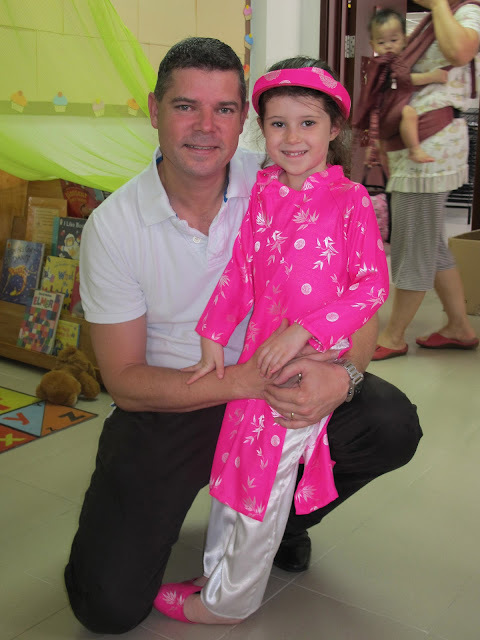 Vietnamese families plan their activities around their children on this special day. In a Vietnamese folklore, parents were working so hard to prepare for the harvest that they left the children playing by themselves. To make up for lost time, parents would use the Mid-Autumn festival as an opportunity to show their love and appreciation for their children. 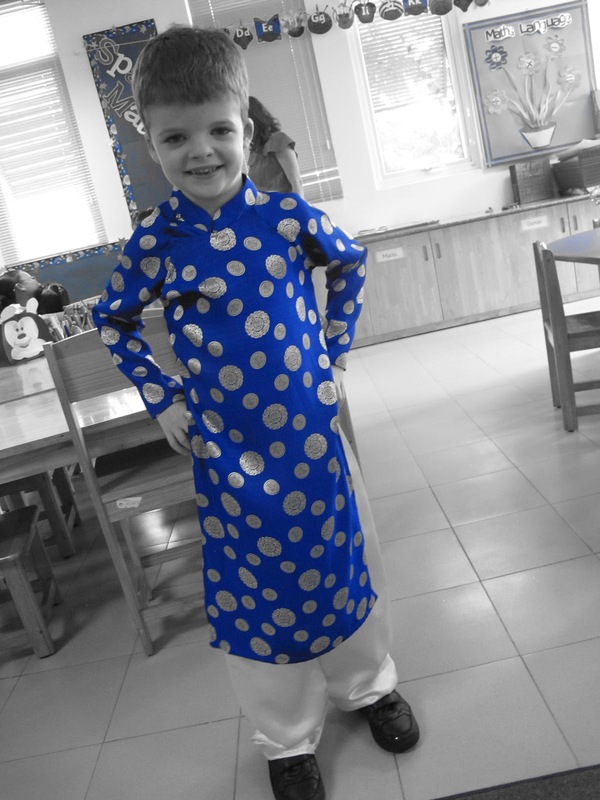 Like the Chinese, Vietnamese parents tell their children fairy tales and serve mooncakes and other special treats under the silvery moon. A favorite folklore is about a carp that wanted to become a dragon. The carp worked and worked and eventually transformed itself into a dragon. This is the story behind the mythical symbol, Cá hóa Rông. Parents use this story to encourage their children to work hard so that they can become whatever they want to be. During the Moon Festival, it is customary to give boxes of moon cakes (Banh Trung Thu) to family and special friends. The traditional moon cakes are usually very rich in taste. They have a bright yoke in the center to represent the moon. They are filled with lotus seeds, orange peel, ground beans. Not a "cake" as we imagine. A wholes days calories in one cake! Traditionally, during the night of Moon Festival, children parade on the streets, singing with colorful lanterns in hands. There are several different shapes of lanterns including butterflies, fishes, and stars. There are also lanterns which spin around when a candle is placed inside (den Keo Quan), symbolizing the seasonal spinning of the earth around the sun. Here are some pictures of the kids enjoying the festivities with the lanterns they made. My shy and retiring wallflower. New ao dai for Quiddy this year. He is growing so fast the old one does not fit any more. Christophers lovely teacher this year, Ms Becky. Quiddy and his butterfly that he made and wrote on telling everyone all about himself. 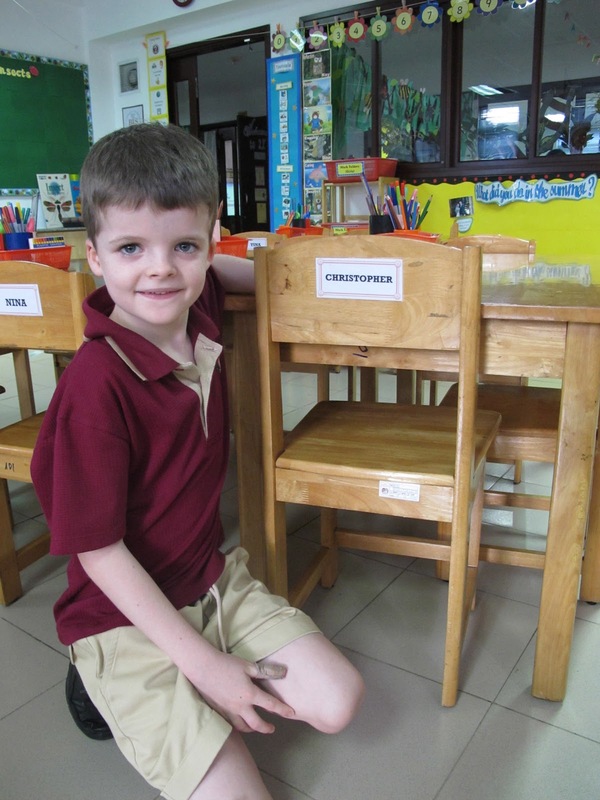 "He is good at running and wants to get better at writing!" The beautiful colours make this a very special day both for the kids and for the parents. They all look lovely. Not to forget Scarletts lovely teacher Ms Katy.